Blockbuster titles and the success of Nintendo's new console helped make 2007 a record year for US video game sales, according to a research group. NPD said combined sales of software and hardware hit $17.94bn (£9.1bn) last year, a 43% jump from 2006. Nintendo's new motion-controlled console, the Wii, pulled in new customers, the report said. 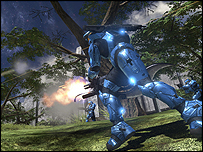 The top-selling game of 2007 was Halo 3 for Microsoft's Xbox, which has sold 4.8 million copies since its launch. Overall games software saw a 34% jump in sales to $8.64bn, with Activision's 'Call of Duty 4' the top seller in December. The computer games industry now rivals the US film business in size, and is growing faster. Box office receipts in the US and Canada rose 4% last year to $9.7bn. 2007 was a blockbuster year for Nintendo which was twice forced to raise production of the 'Wii' as it struggled to meet demand. And its handheld gaming device the 'DS' was the top-selling system last year. Overall sales of games machines soared 54% to more than $7bn, according to the NPD report. But analysts say 2008 will see a switch as hardware sales cool-off. "I wouldn't count on similar growth in 2008," said NPD analyst Anita Frazer. "I would expect to see more growth proportionally coming from software sales."